V8 transmissions, radiators and even the rear ends were found in some prior V8 cars. Be ready to change a LOT of parts, when you go doubling the pressure specs of the cartridge! I wonder if you could add any recent updates to your usage of 45Super through your Glock 30S? I Have recently purchased a G30S, and have considered putting in an after market (longer and threaded) barrel to maximize the velocity for hunting/backwoods use. I am thinking about adding a lightweight compensator (nothing as huge as the 460R comp) and a stiffer spring. With a fully supported barrel, like from barsto or kkm, would you expect I would have any issue shooting hot 45 Super? Anything I should consider with this approach? Hey Bob, thanks for your comment. Since I wrote this piece three years ago I’ve shot and carried the G30S a lot with the minor tweaks mentioned: heavier recoil spring (23 pound) and stronger mag spring (the Wolff +10% ones). It made a substantial difference in felt recoil, and has helped handle the extra power. Since then, I’m sure I’ve put 1,000+ .45 Super power rounds through it (mostly my own reloads). My gun shows no signs of excessive wear that I have been able to tell. Adding a longer barrel and/or comp would of course help, but I don’t have any experience with that on the G30S. Jim, thanks for your quick response! If you have a sec, I have a few more detailed questions. Also, have you ever shot 45 super out of your 30S over a chronograph? Any idea what kind of velocity you are getting compared to regular 45 + P? So, as the 30S has a slimmer/lighter barrel and slide than a regular G30 (or G30SF)… is there level (or hotness) of 45 Super that you would choose to not put through your pistol with the stock barrel setup (If I have understood you correctly, you have the stock barrel)? Have you experienced any case bulging from the less supported stock barrel? Is there a point in your opinion at which the better supported case structure of an after market barrel would come into play? 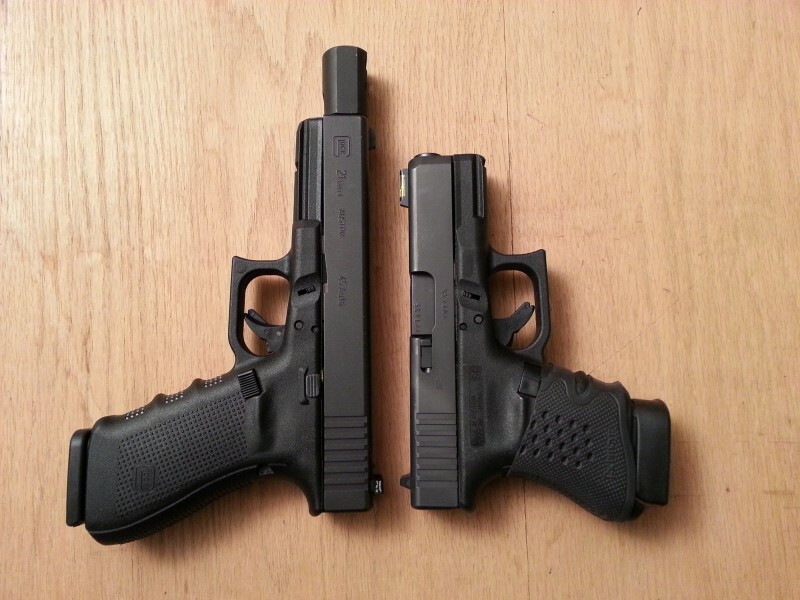 Have you ever had a chance to shoot 45 super through a regular G30 and your G30S side by side? Is there a noticeable recoil difference with the heavier slide of the regular G30, or can that all be mitigated with the heavier spring? My reloads are a little under the power of the BB or Underwood stuff, just to save on some abuse to my hands. I almost always finish off with a mag or two of factory loads, though. Looking back over my reload notes, I initially worked up loads to match the BB specs in our .45 Super data, then backed off just a bit. What I typically shoot now gets about 1140fps for a 185gr, 1100 for 200gr, and 1040 for 240gr. Now, that’s just using a single chrono, and I’m not being nearly as careful as when we do formal tests, but those are the right ballpark. Those are all out of my G30S, the numbers for my G21 and my Beretta Cx4 are higher, of course. Also, I am using Lone Wolf replacement barrels in both Glocks, so those are fully supported. As I recall, I swapped out the G30S shortly after getting it. Before that, I had run into some problems with hot .45 Super out of the G21 with a stock barrel causing bulging. No problem with the .460 Rowland barrel, but I decided to go to a .45 Lone Wolf in it as well, so the .45 Super would properly headspace on it. Personally, I’d switch to the supported barrel, just to be safe. I haven’t done a comparison between the G30 and the G30S. The G36 we used for our tests was stock, and I recall it being ‘stout’ to shoot. I checked the spring packaging (where I have the original assembly), and it says for the G29, 30, and 36. So evidently they’re all the same. It’s been long enough that I don’t remember how I made that determination, but it seems correct. And yeah, you can’t cheat in physics — with the 23lb assembly in place, anything under a .45 +P won’t cycle properly. I usually just shoot loads at that power, but if I want to step down it’s easy enough to swap out the springs. Just compare our data to see what an extra inch or two will gain down at the short barrel length. That should get you in the ballpark. The only way to know for sure is to chrono your gun & ammo.